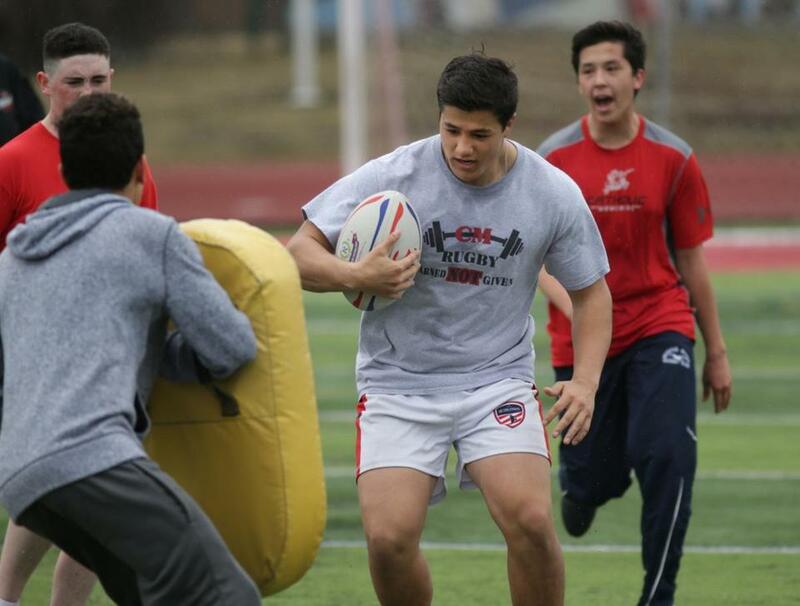 Catholic Memorial’s Sam Lindemann practices with his high school rugby team. Lindemann is committed to play Division 1 rugby at Fairfield next season. On Monday afternoon, Sam Lindemann will confirm his commitment to play Division 1 rugby at Fairfield University. His remarkable journey began not at Catholic Memorial, where the 17-year-old senior is a 5-foot-10-inch, 190-pound center back for the Knights. It started in Kazakhstan, in the middle of winter, when he was just 1½-years old. There, police discovered the young boy wandering around a rundown area of Almaty, the largest city (population, 1.5 million) in the former Soviet republic. He was sick, anemic, and his teeth were rotting. Authorities did not know to whom the small boy, then named Denis, belonged. A woman living in a crash house in a neighborhood of one-story ramshackles with no plumbing and corrugated metal fences took him in. Police learned that the boy’s biological mother was dead. His father was unknown. Seeking a better longterm solution, authorities moved him to a baby house in Almaty and put up for adoption. It was there that a couple from Seattle looking to adopt, Marty and Kathie Lindemann, changed the boy’s life forever. But there could not be an adoption until the Lindemanns received a release from all the known relatives. “What we ended up getting, we came along a year later after they had gone through the search and he was suitable for [adoption],” said Lindemann. So in 2004, Marty and Kathie returned to Seattle from Kazakhstan as a family of four, after adopting Sam and another boy, Henry, now a sophomore at Catholic Memorial. Sam Lindemann ran across the carpeted floor in Kazakhstan to see his new parents for the first time. “When [Sam] came running across the carpet to us, we were down on the floor,” Marty said. “They had a caregiver talking to him either Russian or Kazak, she pointed at us and looked at us. In 2012, the Lindemanns moved to Dedham and the rest is history. 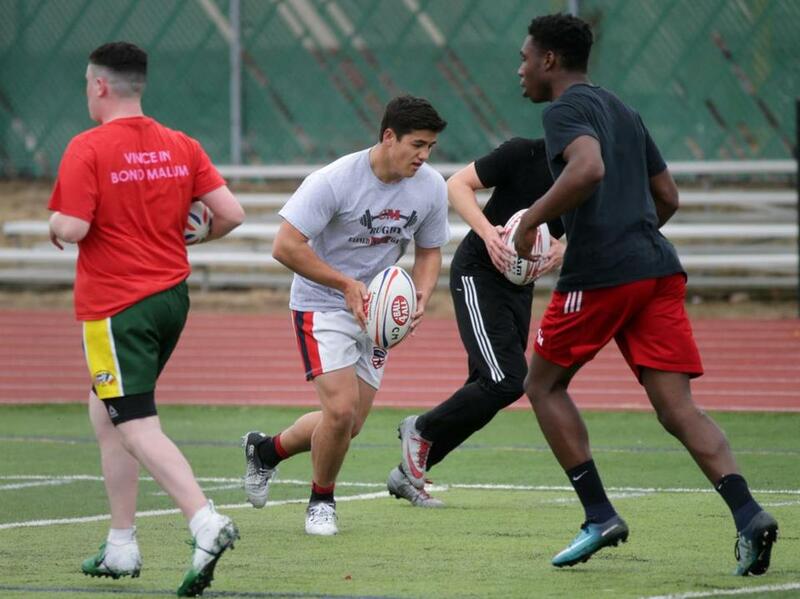 Sam developed a passion for rugby, and joined the CM squad as a sophomore after being approached by head coach Mort Sullivan. He also wrestled for three seasons at CM and and played offensive tackle last fall in the Scarlet Knights’ drive to the MIAA Division 1 Super Bowl. “I like physical contact types of sports, I’m that type of guy,” Sam said. “I played football before, naturally I wanted to play a contact sport. 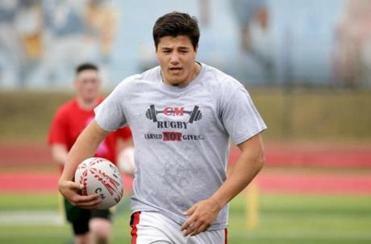 Sam Lindemann (above, with rugby ball), a 5-foot-10-inch, 190-pound offensive lineman on Catholic Memorial’s football team, found a new sport in rugby. “I just liked how the game flowed, nonstop, no pads,’’ he said. In building his roster, Sullivan said, “You try to attract athletes that play sports like wrestling and football, because they have some concept of the game. As a center back, Lindemann is responsible for starting the attack, passing the ball up the pitch to the wings, who like wide receivers in football, run toward the end zone after the catch. Fellow senior Matt Wing, who as the eighthman provides the extra push for CM at the back of the scrum, singled out his good friend for pushing every player to do his best. “Even in practice, if we’re not going 100 percent, his going 100 percent will motivate us to work harder,” said Wing, who plans to play the sport collegiately at St. Bonaventure. When Lindemann visited Fairfield last year, he was enamored with the support the school gave to the program. Rugby is not an official NCAA sport, but has scholarships funded by boosters. Lindemann is a well-rounded student; he has played the piano since first grade and did site cleanup and planted a garden at the former Avery Elementary School in Dedham before it became the Mother Brook Arts and Community Center. He plans to major in business at Fairfield. It’s the next step for a journey that started on another continent, but one altered forever by a loving couple from Seattle. And just as he did when he came running across that carpet in Almaty into his new father’s embrace, Lindemann will once again embrace opportunity, this time on the rugby pitch at Fairfield. The Globe’s 2018-19 Winter All-Scholastic section will be published in the Sunday, April 7th print edition, and published on bostonglobe.com/schools on Saturday, April. 6. The section salutes the region’s best in basketball, hockey, wrestling, indoor track, swimming, gymnastics, and skiing. This week, applications for the 33rd Boston Globe Foundation/Richard J. Phelps Scholar-Athlete scholarship program will be sent to MIAA schools in Districts A, B, C, D, E, and H, along with city of Boston this week. The 14 available scholarships (one boy and girl per district) will be awarded based on excellence in academics, athletics, and extracurricular activities, and will go directly toward each student’s post-secondary education. Return applications are due by May 1.